This story starts, as many do, with me walking into a gun show. This was our little Labor Day show right here at home, if it matters. The third table I came to had a pristine Colt Lightweight Commander from the late 1970s. Now, like I really need another 1911. But, I did what you would have done. And, in short order, I was the proud owner of this lightweight .45 auto. Naturally, I figured to turn it in to an everyday carry gun and my mind immediately began to work out the details. Now that the project is complete, I can sort of pat myself on the back because everything worked out just as I had hoped it would. My first project was to get some decent sights on the gun. With that in mind, I shipped the slide off to XS Sights for installation of their Big Dot Express sights. Since this was to be a carry gun, I wanted a big front sight that was quick to pick up. Most gunfights occur at close range and the quicker you can get on the front sight, the quicker you will get a fight-stopping hit. As usual, the folks at XS Sights were very accommodating, friendly, and efficient. In short, they know what they are doing and they do it well. Next up I contacted my friend Colby Brandon, a first-class pistolsmith and member of the American Pistol Smiths Guild Colby did an action job on the pistol and generally tuned it up. In the course of which, he had to replace the sear in order to give me a 3 1/4-3 1/2-pound trigger pull. More importantly, the trigger breaks clean and crisp. While all of this was going on, I discovered Kevin Johnson, in Clarendon, Texas, (806-205-0435). Kevin is a gun engraver who also creates a lot of western and lawman jewelry. He also makes the silver pistol stocks that have always been popular with Texas Rangers and border lawmen. The set that he made for me have my old cinco peso badge in the middle of each stock. 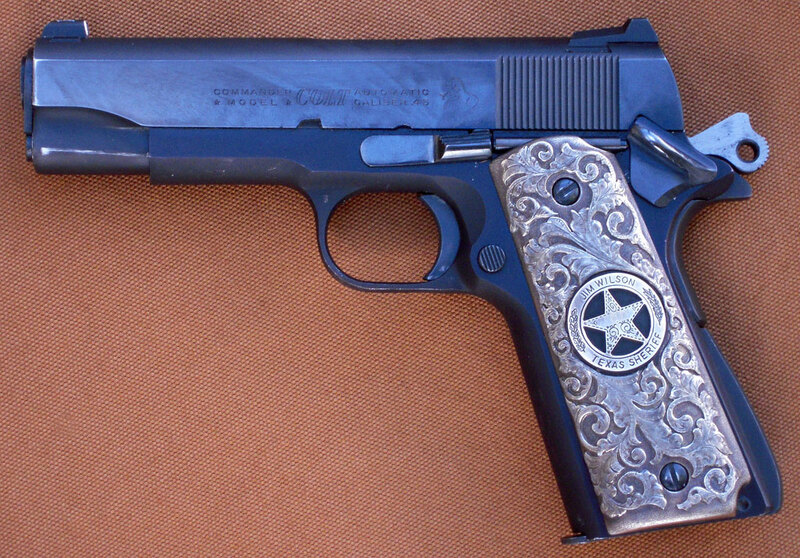 This entry was posted in Guns, Personal Defense, Semi-Auto and tagged .45 ACP, 1911, Colby Brandon, colt, gunsmithing, Kevin Johnson, texas, XS Sights. Bookmark the permalink. Jim, looks like an early Christmas present! I just picked up another S&W model 19-3, P&Rd, 4 inch. Just like my last model 19 the sideplate need rebluing. Those damn rubber grips need to be outlawed on blue guns!!!!! All they do is hold in moisture and cause rust!!!!! I love your grips, but they are really going to increase the weight. You don’t have to worry about breaking them though! LOL!!!! Actually Steve Wice, I’m the maker of these stocks, and they only weigh about 3.5 oz. that’s less than most factory made ones! I’ll be calling you shortly about a set of those grip panels for my carry gun. This is much more customization work than I’ve needed for any competition firearm I use. What rear sight is on your lightweight commander. And did XS Sights cut the dovetails in your slide?